Alfred Percy Iliffe (born in Ryton-on-Dunsmore, Warwickshire on 10 April 1891). Cecil’s parents evidently started their married life Warwickshire, first in Brandon, and then (by early 1891) in Ryton-on-Dunsmore. His father is described in the 1891 census as a silk broker, and the family had one servant. In 1893 when Cecil was five his mother died at the age of 39 (registered third quarter). From 1898 to 1902 Cecil attended St Peter’s School in Coventry, which appears to have been an ordinary National School. By 1901 Cecil’s father had moved with his four children to Coventry, and the census shows them living at 13 Stoke Row and looked after by a housekeeper, Miss Louisa Mercer (64). Cecil is listed by the name of Arthur in that census, and his father is now described as a manufacturer of cords, while the occupation of his brother Reginald (15) is given as “Cord business for cycles”. Reginald was evidently spending a period working for his father, but was later to go up to University. In 1902 when he was 14 Cecil also went into business for six years (probably with his father). Cecil’s sister Emilie died at the age of 19 in 1908 (registered third quarter). In 1909 the family’s address was The Elms, Upper Stoke, Coventry. From 1909 to 1911 Cecil received private tuition, and was admitted to Emmanuel College, Cambridge on 9 October 1911 (when he was nearly 24 years old) to read History and Theology. Cecil’s brother Alfred (who was educated at the King Henry VIII Grammar School in Coventry) was matriculated at the University of Oxford from St John’s College on 8 October 1909. During his first Long Vacation in 1910, when he was only 19, he married Florence H. S. Mellodew in the Coventry registration district, and at the time of the 1911 census he was with her in a boarding house in Bournemouth. In 1911 Cecil’s father, now a widower and retired, was living at 13 Stoke Row, Clay Lane, Coventry with Reginald (25) and Cecil (23), who were both described as students, and their housekeeper Emily Anne Price (40). Later that year Cecil’s father died at the age of 74 (registered third quarter in the Coventry district). In the first quarter of 1912 Cecil’s brother Reginald married Elsie B. Martin in the Coventry registration district. Cecil’s brother Alfred graduated with a pass degree on 19 June 1913, and moved with his wife to Overdale on Foxcombe Hill in 1914. As their parents were dead, he presumably acted as Cecil’s next of kin. Cecil obtained his B.A. (Class 3) from Cambridge in 1914. In 1915 he went to Ridley Hall Anglican Theological College in Cambridge, but postponed his ordination to go and fight. In the First World War Cecil Arthur Mountfort Iliffe served as a Private in the 9th Battalion of the Royal Fusiliers (Service No. 10612. He died in France on 13 August 1916 at the age of 28 (not 32 as recorded by the CWGC) and was buried at the Puchevillers British Cemetery (Grave I. F. 79). 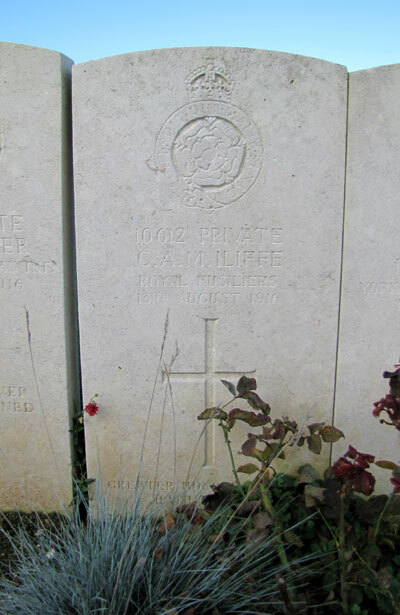 Iliffe is remembered on the war memorials in St Leonard’s Church at Sunningwell and in Emmanuel College, Cambridge. This is one of the 40% of war graves that bears a personal message at the end (for which the family had to pay 3½d per letter). 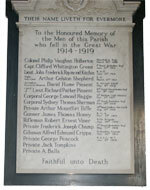 Cecil’s brother Alfred (born 1891) also served in the First World War from 23 January 1916, as a First and then a Second Lieutenant, and was mentioned by the Secretary of State for valuable service in connection with the war: he is listed under “Those who served” on the board in Sunningwell village hall. Molly Iliffe (born 1916, reg. third quarter); she married, but her husband died young and they had no children. She died c.1988. Arthur Cecil Iliffe, always known as Peter (born 1921, reg. second quarter). He had two daughters from his first marriage, Barbara and Ann Iliffe, and one from his second, Tracy, born 1972. He died in 1982. Reginald Charles Iliffe lived to be over 90 and died in 1976 in the Coventry registration district. John I. Iliffe (born 1925, reg. third quarter). Alfred’s son Alfred A. M. Iliffe married Betty M. Wilson in the Oxford registration district in the third quarter of 1947, and they had two children whose birth was registered in that district: Jane Iliffe (1948, reg. fourth quarter) and Shirley M. Iliffe (1951, reg. first quarter). Alfred Percy Iliffe was still living at Overdale on Foxcombe Hill in 1928, but he then moved to Oxford: in 1935–47 his home was at the Rink House on Botley Road, in 1954–1962 at 348 Woodstock Road; and in 1964–70 at 96 Banbury Road. He died in 1970 in the Oxford registration district.